Who doesn’t love a good old pie from time to time?! Well this roasted vegetable and feta pie ticks all the boxes but is lighter than a pie you may devour through the winter months. Filo is light and crisp and is perfect for a light lunch or dinner. I have used a selection of vegetables with a Mediterranean vibe but you can mix and match until your heart’s content. In order to keep the pastry crisp I have chosen to part roast the vegetables in advance so it draws out some natural moisture before popping into the pastry case. Unlike other pies this does not require precise tin lining so think of it as a free form pie that is perfect for pie making novices and well seasoned cooks alike. You will require a pie tin which is around 20cm in diameter which will feed 2 very hungry people or 4 for a lighter dinner. 1. Preheat the oven to 200c/ 180 fan. Do check the cooking instructions on the packet of filo as temperatures may vary from brand to brand so adjust accordingly. Whilst this is heating, cut the vegetables into small chunks and place on a baking tray with the garlic cloves, seasoning and olive oil. Toss so they are well coated and roast for a few minutes until beginning to soften. 2. In a small pan, melt the butter over a low heat. Use a pastry brush and brush a little of the butter in the tin. Take one the first filo sheet and lay in the tin before adding more butter to this sheet. Repeat until the sheets of filo are all layered; I offset each layer so they can be gathered more easily to form a crust. If you layer the sheets like this you should end up with a star formation. The last layer should be brushed with pesto so the vegetables will sit on top. 3. Take the roasted vegetables and scatter some of the feta amongst them before placing in the lined pie tin. Gather the loose edges of the filo and you can either bring them into the centre of the tin or, as I did, fold them in to form a crust so you can see the colourful vegetables in the middle. 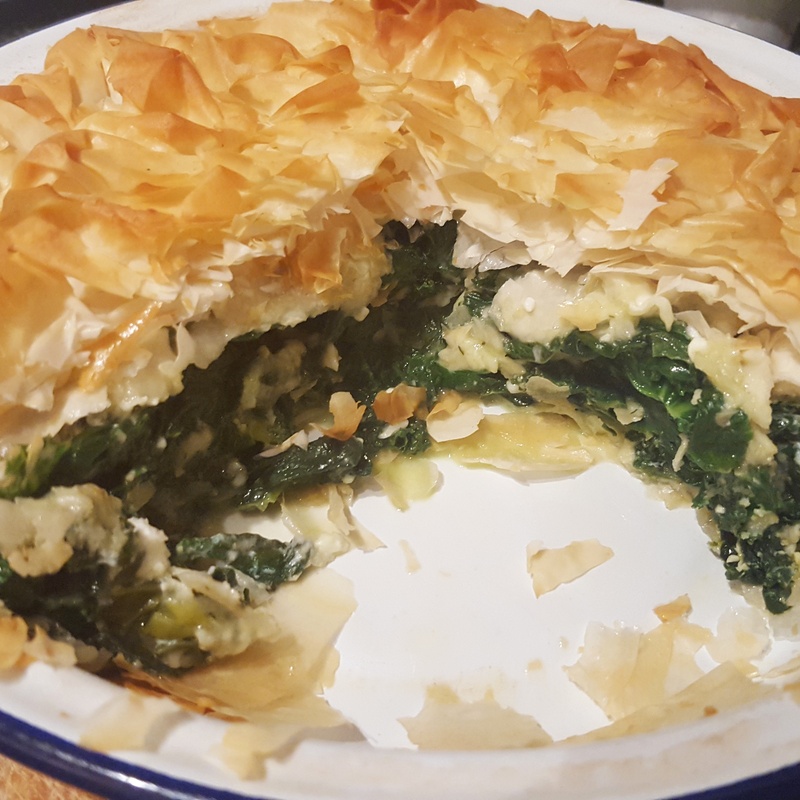 If you do this then add a little more feta crumbled over the top before popping in the oven for 15-20 minutes (depending on the pastry cooking time on the packet) until the filo is crisp and golden. Serve with a side salad and some buttered new potatoes if you like and dig in. The pie is also great for lunch the next day if there are any leftovers but this is highly unlikely! Roasted vegetable and feta filo pie- a taste of the Med at home this summer!